The M-Sport World Rally Team will be seeking new heights as the FIA World Rally Championship (WRC) makes a return to gravel at next week’s Rally Mexico. As the Ford Fiesta RS WRCs do battle through the region’s mountainous stages, the squad have their sights firmly set on a strong result. The Mexican fixture is renowned as one of the most vibrant events of the year, but the joie de vivre of the colourful stages mask a daunting challenge. With the route climbing over 2,500 metres through the Sierra de Lobos and Sierra de Guanajuato mountains, oxygen-starved air can see performance fall by as much as 30 per cent – putting additional pressure on the crews with little room for error. Given the reduced power, even the smallest of mistakes can be dramatically unforgiving and the M-Sport crews will need to have their wits about them as they tackle a mix of fast flowing roads interspersed with more technical, twisting sections. The event also plays host to some of the longest stages of the year. A real test of endurance, crews will encounter a mammoth stage on each full day of competition – two passes of the sweetly named ‘El Chocolate’ (44.03 kilometres) on Friday, 53.69 kilometres of ‘Otates’ on Saturday and the longest test of the rally, ‘Guanajuatito’, at 55.92 kilometres, on Sunday’s final leg. One driver who knows how to deal with any challenge thrown up by the Mexican event is Mikko Hirvonen. The Finn claimed the runner-up spot on his last three appearances and, together with co-driver Jarmo Lehtinen, can boast more starts than any other crew in the championship – the pairing having contested the rally on eight previous occasions. Familiarising himself with the characteristics of the proven Fiesta, Hirvonen continues to grow in both confidence and performance. Following a fourth place finish at the previous outing in Sweden, the Finn will be looking to challenge for the podium as he aims to extract further speed and assurance from the loose-surface speed tests. By comparison, Elfyn Evans will make his Mexican debut next week as he continues his development behind the wheel of the Fiesta RS WRC. The event marks the Welshman’s third new event in succession, but the youngster is relishing the opportunity to learn from each new experience. Evans may be lacking in familiarity when it comes to Mexico’s specialist stages, but his co-driver Daniel Barritt is something of an old hand. This will be the Lancashire lad’s fifth outing having most recently navigated Toshihiro Arai to second place in the Production World Rally Championship in 2010. Barritt’s knowledge will prove a huge benefit to Evans as he progresses alongside his experienced team mates. Having each contested a full day’s testing in Northern Spain to rediscover the art of gravel rallying in the expected conditions, both Hirvonen and Evans are ready to face the upcoming challenges. Fully committed to their respective goals, the pairing will be keen to score some strong points for the M-Sport squad. “Jarmo [Lehtinen, co-driver] and I have done well here in the past so hopefully we can continue that this year. I wouldn’t say that there was necessarily a key to doing well here. Like all events, you just need to avoid mistakes. “The altitude makes a big difference in terms of performance. You don’t have as much power so you need to consider that and it does inevitably alter your driving. The crucial thing is to carry the speed through the corners as you can’t gain it back so easily on the straights. But as you’re trying to go flat-out through every bend, you need to be careful as sometimes that can take you by surprise. “We’ll also see some really long stages which I enjoy. It’s a nice change as we don’t see them so often anymore. It’s a good challenge for a driver as you need to be really focused and keep concentrated, but even if you make a small mistake you have the opportunity to make it back. “This event offers another new experience. I’m not sure of exactly what to expect, but I have a good idea from the test. “It’s important to drive a very smooth line and carry good speed into the corners as the lack of power makes it difficult to recover any time loss. For us, we just plan to drive as smoothly and as cleanly as possible – to gain the experience and gradually improve our pace throughout the weekend. 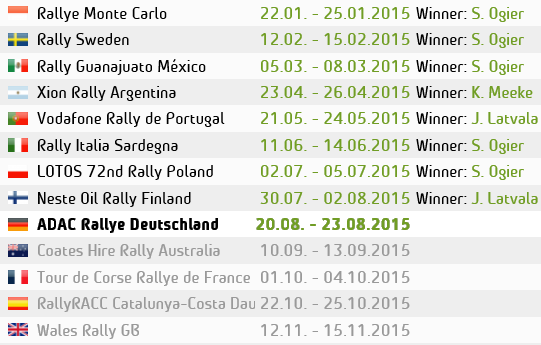 “I’ll also be tackling some of the longest gravel stages of my career. I’ve certainly never had to contend with so many long stages in a single event, but I am looking forward to the challenge. We’ve done a lot of preparation on the physical side, so hopefully that will prove effective and we can concentrate on looking after the car and setting some good splits.